was born in Steubenville, Ohio. She was born into an Italian family named “Carpico.” She attended West Virginia University where she majored in music. Trained classically with former Metropolitan Opera star Francis Yeend. She made several guest appearances with Royal Caribbean Cruise Lines aboard the “Song of Norway.” She recorded the lead singing roles for Calista Flockhart & Sharon Stone in two of HBO’s animated “Happily Ever After For Every Child” series. She recorded “You Got Me Dreamin” for the box office film “Hungry Bachelors Club.”Patricia had the honor of singing the National Anthem and “Americia The Beautiful” on two separate occasions for former President Clinton, former President Ford, and General Schwarzkopf. She performed the National Anthem for Nascar. 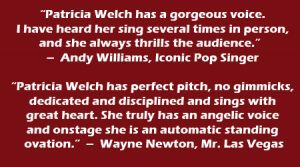 She was a featured soloist and performed duets with Grant Griffin in Las Vegas at the Orleans Hotel/Casino in theGrant Griffin Production “Magical Night of Music”. In the Britney Spears “Brave New Girl” movie, two actresses who played the roles of Holly and Angela, lip-synced to Patricia’s voice. Patricia toured with Robert Goulet. She was the featured soloist and sang duets with Mr. Goulet in his show “The Man And His Music”. 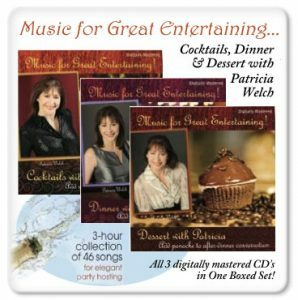 In 2005 & 2006 Patricia was a featured solist in the Wayne Newton Show. 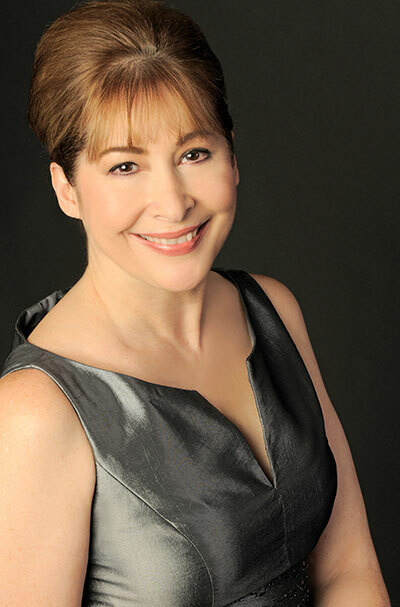 Patricia performed a duet with Robert Goulet, for a 2007 PBS Special. Following the tragedy of September 11th, Patricia and her husband wrote a patriotic song entitled “United We’ll Stand.” They hope it will be a source of encouragement to all of those who have been affected by that tragedy. 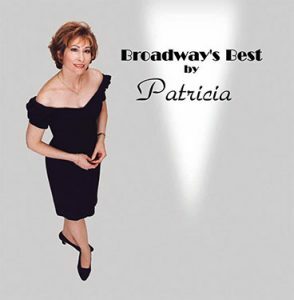 Patricia performed “United We’ll Stand” in Washington, D.C. at the September 11th, 2002 Memorial. Patricia’s husband, Pete DuBarry, wrote the lyrics to this song that she composed as a tribute to the heroes of that day which will live forever in our memories and hearts. Learn more about Patricia; her near death experience and how she’s giving back, Click here. She is thankful for all the blessings she has been given, most of all, her husband and family.